Which Curtain Heading to choose? Can you produce Eyelet Curtains? What kind of Curtain Lining? How much Curtain Fabric do I need? My aim is to provide you with beautiful custom made curtains to a consistently high quality. I achieve this by doing much of the work by hand. This decision affects the look and style of the completed curtains, but my guide to Curtain Headings should help to de-mystify the topic. 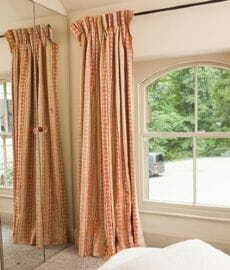 It's difficult to be too prescriptive, but the standard curtain heading tends to be pencil pleat, pinch pleat headings are often associated with more traditional decor and headings such as eyelet and tab top provide a modern and comtemporary feel to interior decor. The key to producing high quality Eyelet Curtains is using a modern eyelet press. You will see mine on some of the pictures on the web-site. If you make your own curtains but don't have an eyelet press, I am happy to add the rings for you. 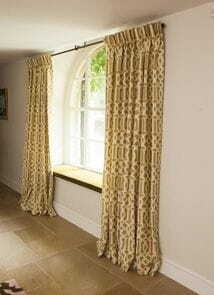 Send or deliver your curtains to me, marking where the eyelets are needed & I will do the rest. I stock satin nickel rings but can obtain a range of different finishes. Another important part of getting exactly the made to measure curtains you are looking for is the decision on which curtain linings to use. Take a look at my guide to curtain linings which should point you in the right direction. Whilst the main curtain fabric impacts on the decor of your room, the curtain lining affects the properties of the curtains. The most obvious are blackout lining for blocking light and interlining for retaining heat and preventing drafts. I supply lining fabric but not main curtain fabric. However, I'm happy to suggest some alternatives, both on and off-line, when you get in touch. A good start point is to check out my guide to measuring curtains which will provide the essentials for measuring the space to be covered by the curtains. Other factors to be taken into account are the amount of fullness required in the curtains, partly determined by the curtain heading chosen and the pattern repeat of the chosen fabric. If you still have questions or just prefer to chat things through, then just give me a call or drop me an e-mail, I am always delighted to advise. Don't forget that I have a separate page describing the range of curtain alterations I can undertake and another one of those curtain extras like tie-backs and pelmets.